Power Spread is the Union of seemingly Disparate Elements, not only the game of Football, but in LIFE. Power=Capacity. Spread=Full Capacity expanded beyond. Always growing. Life => E=mc². Football => PS=st². Football offers a great microcosm for the game of Life on our planet. Power Spread is all Football. Where it's been and where it's heading. Every year for 100 years (something like that) I have made bowl picks with my friends. Even back in the 80s when I really didnt know much about the teams that didn’t possess the name Ohio State. Of course, back in the day, most of my forecasting centered around the NFL, for I was a HUGE NFL fan – when there was loyalty amongst players and management and a chance to build a real TEAM and not just rotating parts revolving around an overpaid “star”. I even called a bookie as a 12 year old to try to place a bet, not knowing there was an age minimum. Probably thankfully, I have never had much of an urge for gambling as an adult. BUT, I have always been fascinated by the concept of Time and trying to see into the future – what works, what doesnt, and how much knowledge and intelligence can be used to solve this unknown. Even when I was a Physics Major back at Bucknell U, I was always questioning my Quantum Mechanics teachers about factors of time/space and predictability – much to their dismay – as for them and our whole Human race, these questions still remain an unsolved puzzle. I have some theories and observations that I will leave for another post at another Time. But for now, taking this simple concept, I will use this Bowl Season as a very “light” experiment. My good friend from Philadelphia, Dave, and I have been having a little two person poll since 1997. In the beginning I really didnt know much more than Dave. As the years went by and I ditched the NFL and became more of a College Football fan, the gap between our knowledge base widened like the Grand Canyon. Yet the overall numbers really didnt change much. The bottom line was that I always tried harder and I ended up winning the 2 man poll every year except in the 2009 Season (I got my revenge last year :)). What does it all mean – its hard to tell, but ’09 was the first year where the temperatures dropped in the South and I got burned picking a lot of SEC teams who lost in cold conditions that year. I was really far behind Dave at one point, but adjusted accordingly and caught up to him the last week with the Title game as winner takes all! I lost when Colt McCoy went down after an early promising start for Texas making me wonder if it was simply in the “cards” that my streak had to come to an end some time and 2009 was the year. But I do feel that a lot of what’s happening with constantly changing coaches/schemes and the battle between Old School and New School with these schemes, that we are seeing more unpredictability than ever before, which obviously helps to level the playing field. In fact, maybe the original 50/50 chance of any team winning any game at any time or place is in effect as much now as it was when they first started playing the game in the Ivy Leagues in the 1800s. Or is it just a matter of understanding the Changing Face of Football – from weather conditions to schemes and the coaches who can implement and adjust the quickest? Does the forecaster now have to catch up to the times – like the coaches – and expand his knowledge base in an attempt to make the game more simple than it appears? With that said, my knowledge base this year is unfortunately at its lowest since the 2001 Season when I first started getting the Phil Steele books and learning all the players and coaches for the upcoming year. I simply haven’t had time this fall due to entering the “Website Business”. Ironically, this will also hurt Dave since I started offering Dave advice as a courtesy in recent years so that he would have more of a chance. I dont think that helped him much though in 2009 as Dave tends to be stubborn in his opinions, well informed or not, picks based on his “gut feeling” no matter how much I try to educate him. Though he says he does take my insight into account……hmmmm…..? So here we are – Bowl Season 2011 and while I have accumulated a lot of knowledge over the years, I’m as clueless as I have ever been to a lot of the changes that happened in this particular year. Still, there’s a big enough gap between Dave and I (I think!) that it will still another year of experiment as to whether knowledge or the mystery of random luck has the upper hand in picking winners. And, lastly, as a prelude to next year – I should be back to my usual obsessive College Football self in 2012, up to date on all the changes and happenings heading into next Bowl Season. Thus this is a general experiment in Half-Knowlege(Drew 2011) vs No-Knowledge(Dave Always) vs Full-Knowledge(Drew 2012). Lets see if there’s any sense to be made of any of this?? It may seem that we are driving a car in a fog in the middle of the night and forgot to turn on the headlights, but be patient loyal fans, for there is more to come – a lot more. Truth be told I am a professional Tennis writer also and I am trying to develop a professional Tennis Site for the new year. This has cut into my time for Football more than I would have liked. But I also have been doing a lot of work behind the scenes (A LOT! – ask Kurt) and will be implementing a lot of this work into the site during the following year in what will really be our first LEGIT season of College Football in 2012. We will continue experimenting and working behind the scenes during the CBasketball season so expect some fun stuff – especially as we get closer to March Madness. But the main thrust of this site is the Changing Face of American Football and in line with this theme there will be some real changes to the site – from the home page design to all the categories and sub-categories. We wont stop until we are satisfied with what we believe is a suitable product for mine and Kurt’s grandiose ideas! We will also make the site more conducive to quicker posts, which will mean much more material along with more timely material. Eventually we will work in some “live” minute to minute action with the NYC Underground becoming totally immersed in the College Scene around the city. Lastly, I have been working on a full “connect the dots” History of Spread offenses and where they actually started and how the Power Spread came to be. In fact, 2 weeks ago I worked 24/7 for a week straight accumulating information to add to what I already knew on the details of how it all began in the 50s(for the most part), grew in the 60s, exploded in the 70s/80s, solidified in the 90s and grew again from a passing spread to power spread in the 00s. It will take weeks and months to share all this info and I will slowly be leaving posts on the site – especially once the categories are more organized to enable quick access to the information. For now, Kurt and I will share the Bowl Season with our excited reader(s) and work hard at producing a product for next season that we can all share in and learn a little, live a little and most of all, HAVE FUN with the great sport of Football! I was cleaning up the mess from last week and came across this interview with Kragthorpe in Nov,2003 about his first QB at Tulsa, James Kilian – a mobile QB that Kragthorpe structured his offense around. In modern football, with the speed and athleticism of the defenses out there today you have to have a guy who can make some plays with his feet and James can do that as evidenced with the runs he made the other night. What it does for us offensively is that it allows taking advantage of his abilities and making people defend the quarterback. If the guy is just a pure pocket passer without the threat of running the football whether it is a little speed option, whether it is a zone read play, whether it’s a quarterback draw, or whether it’s throwing the ball back to the quarterback like we have done on a couple of occasions, then you have become a little bit easier to defend. So, I think that James and his abilities make it tougher on defenses in terms of preparation for our entire offense and then you know. Before that he was a BYU boy (his dad a coach on the staff), but was thrown into the Texas A&M option offense, which the head coach wanted him to change to the “west coast” style byu offense. Then after Tulsa he inherited the complicated (both scheme wise and off the field issues) Petrino Louisville team. Then back to A&M under west coast Sherman, who had to give in to doing some power spread due to injuries and ineffective passing from the QB. Now he’s basically went backwards with Old School College/Pro set Les Miles. Miles was actually a good OC himself – BUT THAT WAS IN THE 90s!! He wont progress. But Krags just does what the boss tells him – no really unique stye. But there’s no doubt that Tulsa was by far his best Offense – power spread! I just cant help but wonder – if he had been paired with the next OC at Tulsa – Gus Malzahn. Brilliant QB mind with a brilliant Spread mind and Herb Hand as Oline coach bringing ideas from Rich Rodriguez’s PS at West Virginia. I venture to say that as great as the Malzahn Tulsa offenses were, they may have been better! Even if Meyer hired him as a QBs coach for OSU – I would love that. He has parkinson’s , but he is still a big part of LSU’s offense. He would help out young Tom Herman, an up and coming talent himself, but who has the job of QB coach along with OC. Of course, I have full faith in what Meyer’s doing at OSU and his moves so far have been practically perfect, imo. Kragthorpe is a great qb coach – a good play caller and game planner – he has proven all of this everywhere he’s been. Even at Louisville, Brian Brohm had a HUGE senior season in Krag’s first year. This was the one place where Kragthorpe’s incredible flexibility got in the way as he tried to mesh his his less complicated BYU system with a very complicated NFL style Petrino passing game. In this one case a little bit of hard headedness may have paid off – trash the Petrino system after Brohm graduated and start new. But it was much more complicated than that. And with all the off the field issues there really was no hope. Maybe if he can keep the Parkinson’s at bay we will yet see some more surprises by this coach who shocked the world at Tulsa a decade ago. But it wont be with Mile’s old school schemes. It will be with one of the multitude of brilliant coaches out there today experimenting with the POWER SPREAD! First, Herman at OC combining like minds with WRs coach Stan Drayton (former Florida asst under Meyer) and HC Urban. Now Coach Withers, who will continue to grow his impressive resume, teaming with another top “up and coming” defensive mind in Luke Fickell. Apart from getting Charlie Strong to leave his HC position with Louisville and join our staff, this couldn’t be a more impressive list of assistants that Meyer is accumulating. Meyer, by his own admission, spread (no pun) himself too thin trying to manage every aspect of the huge Florida football program. While Tressel never admitted the same, its pretty obvious that he did the same. Not only with all the problems inherent in today’s modern big college football program, but just in the way his offenses went sour after Troy Smith left – especially evident in the whole Terrelle Pryor debacle, where, not only were the offenses during this time never able to really take advantage of Pryor’s skills, but the off the field problems that Pryor was a part of arguably led to Tressel losing his lofty position a top the College Football mountain. Tressel was a great coach with one serious flaw that contributed to problems in his offensive schemes and even more tragically problems off the field. That same flaw, while present in Meyer at the end of his time at Florida, really does hold the same validity when comparing his career path with that of Tressel. Meyer worked his way up the ladder at BIG SCHOOLS. Tressel also was an assistant at some big schools (mainly OSU in the 80s when he missed coaching with Meyer by one year), but once he took over Youngstown State his “up the ladder” progress was basically over. He ran Youngstown State – I mean RAN every aspect on the field as well as off. He was the “Senator” way before that moniker was used at Ohio State. Ironically, the same success that got Tressel the GRAND OSU job is the same success that ultimately led to his ignominious and truly tragic ending. Tressel is a good man and a great coach – everyone who really knows the man says the same thing – but he took on too much at OSU and it caught up to him – first with his anemic Offense, then with his bungling of “off the field” issues. Coach Tressel needed some better assistance with his offense – maybe a new mind, or just a little less control. He seemed to be giving a little more freedom to Darrell Hazell near the end with some decent results. But he could never totally let go of the control that he has always had since YSU. The story is tragic because Coach T is a smart man and with some new influences from other like minds may have once again been able to show his prowess at putting together good offenses. Don’t forget the incredible jobs he did with a very poor thrower in Craig Krenzel and a very raw product coming out of High School in Troy Smith. Even the way he used lanky Todd Boeckman needs to be commended. The real trouble started with Pryor and the insistence of using him in a pro passing/multiple scheme offense, forcing a very round peg into a square hole – a lot of room for mistakes. I do not expect the same tragic error from Meyer for two reasons. First, Meyer has had a long coaching history in big programs under big coaches. He has had a lot of influences before taking the head job at Bowling Green, let alone the head job at BIG SCHOOL Florida. In other words, Meyer knows the value of assistants and HELP! Not that Tressel didn’t – all good coaches understand this – but his wisdom in accepting help seems to have gotten away from him after YEARS of the TRESSEL WAY. Not necessarily ego – maybe more of a lack of practice – as the demands at OSU were far greater than YSU and have even become greater since the infamous Maurice Clarett days. Urban has had the advantage of “growing” into a Big College Head Coach – an advantage that Coach T never had as he was basically “thrown” into his big position. The autonomy that worked in the early 00s didn’t quite do the trick as we approached a new decade at what seems like warp speed. Second, Meyer already had his spell of over managing and luckily got out before Florida suffered years of bad offenses, mediocre teams or bowl bans and coach dismissals. Not to say that is the scenario that Florida was headed, but their last offense was a bungled attempt to pull away from Meyer’s own successful Power Spread and there were plenty of rumors of off the field issues and discontent among the players during his last two recruiting classes. Now, with a year away from the game and seeing what happened with Tressel, Meyer has some perspective never afforded our former great coach. We already see in the way that Meyer is assembling his staff that he’s ready for new blood and like minds to help him in all aspects of running a major college program. For all the talk of Nick Saban’s brilliance in defensive schemes and recruiting I always felt his best attribute, bar none, was his ability to delegate. On the field as well as off. One last note on Meyer and his overall awareness of all things football. He was a Special Teams coach in the past in addition to his job as a WRs coach. He LOVES Special Teams – just like another former great coach at OSU. And I can bet you he will not stop until he is satisfied with the quality of EVERY SINGLE MEMBER OF HIS STAFF including our Special Teams coach. It’s an indisputable fact that there are very few programs in college football with histories at rich and storied as that of the University of Nebraska Cornhuskers. Another commonly held fact is that few other – if any – fan bases travel as well as that of Nebraska (former Husker Roger Craig said once that if Nebraska scheduled a game on Mars that their fans would find a way to get there to see it in person). They’re also known to be the friendliest and most polite fans known to college football, something which today seems to almost be a complete impossibility. 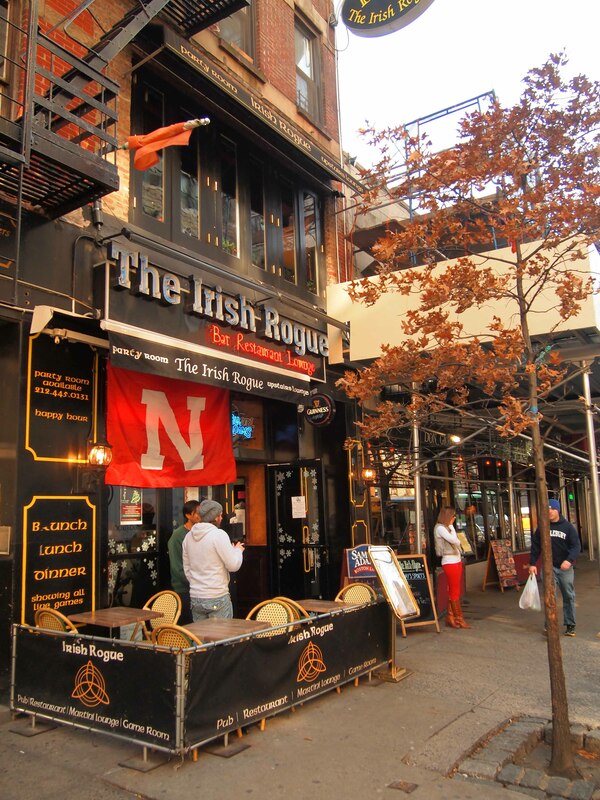 While I wasn’t able to travel to Lincoln to see my Buckeyes take on the Huskers in their first Big Ten home game I set out to confirm these things for myself at their New York City headquarters: The Irish Rogue. For its first season in the conference the B1G and Mr Delany gave Nebraska the most challenging schedule it could come up with: Wisconsin, Ohio State, Michigan State, Penn State and Michigan. After a melt-down in Madison to kickoff B1G play they managed a miraculous comeback at home against Ohio State, then a few weeks later they thumped Michigan State at home and set back out on the road where they topped Penn State. No team in the B1G since Penn State in 1994 had beaten Ohio State, Michigan and Michigan State in the same season, on this Saturday I joined the NYC Husker faithful as they took on Michigan in an attempt to match Penn State’s feat. I will say that noon kickoffs can tend to be a bit rough, this is especially the case in New York City when you consider weekend subway commutes (any New Yorker will tell you weekends are even more difficult because of MTA repair-work schedules). That said the crowd was a little late-ish to arrive and to a degree it never arrived at all. I get that the Huskers are new to the conference and that they’re going through the whole getting to know the neighbors thing, but they were playing Michigan! I was fortunate to find a spot at the bar and to quickly make a few new friends (one of whom was a Florida fan – that went to Florida State, strange world). 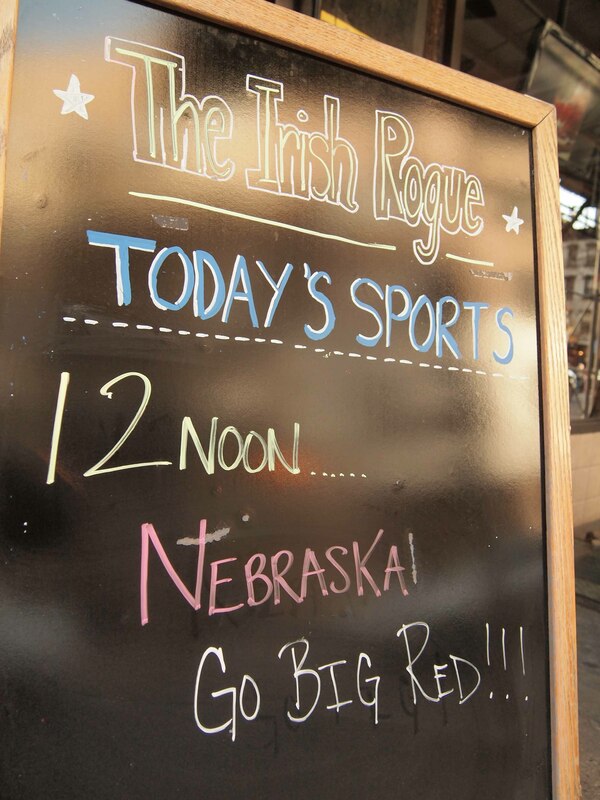 I was informed that that the lack of crowd was unlike most Husker game-watches at the Irish Rogue. During the commercial breaks of the game on this Saturday we were made to actually watch and listen to them. I was told that usually they do put music typical to the Nebraska Cornhusker culture on during breaks. However this was the responsibility of the bartender and unfortunately this bartender was not going to be hassled with whatever Cornhuskers listen to. I was also disappointed to not hear a single Husker cheer, not even early in the affair when they were hanging with Michigan. Based on what I understood from some of the patrons at the bar this may though have something to do with the culture of the fan base. I asked what Husker fans are typically like and he asked what Ohio State fans are typically like. We needed a common ground to sort this one out, we quickly arrived a Texas Longhorns fans, their former (hated) conference rivals. He said Horns fans are total jerks. I explained that in my experience from an OSU game in Austin (2006, Ohio State won 24-7) I found that they were anything but jerks! My Husker friend went on to tell me that even when the team doesn’t play well in Lincoln the fans never boo or scream for a coaches head, but this also means that the stadium environment can tend to be quiet, just as I discovered at the bar. He somewhat lamented this reality saying that he wishes at times Nebraska fans would be more intense. My two cents: there’s nothing wrong with being too friendly and hospitable. Ultimately and sadly there was very little for the Huskers inside the Irish Rogue to cheer about on this Saturday afternoon, the game slowly got away from Bo Pelini’s team and they badly lost to Michigan 45-17. 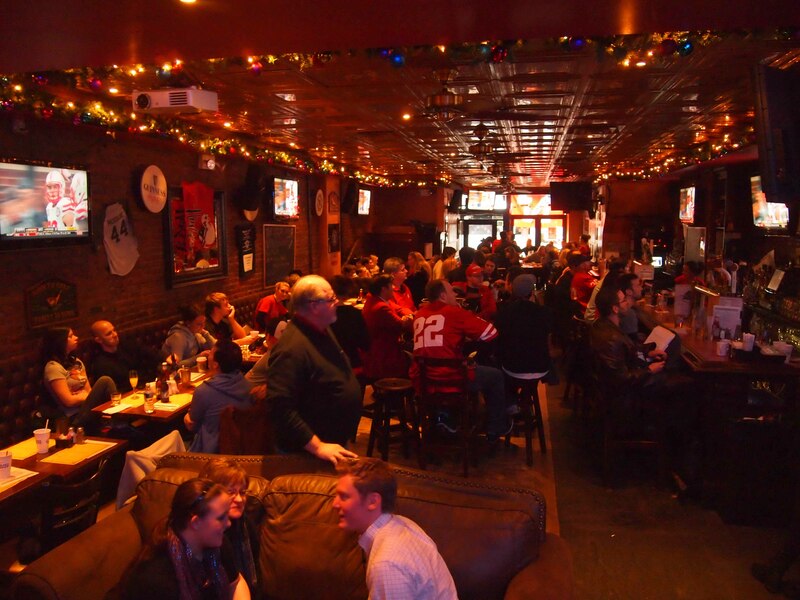 However I will certainly make it a point to get back to the Irish Rogue for a more lively game-watch experience and another opportunity to share company with the quintessential Midwesterners that are Nebraska Cornusker fans.